1671 ~ 1682: born in Ôsaka. He starts his career in a troupe of children-actors (kodomo shibai), playing under the name of Noda Kuranosuke. 5th lunar month of 1682: Kuranosuke settles in Edo and plays at the Ichimuraza the role of Soga Gorô in the drama "Kôshoku Kamakura Gonin no Onna". 8th lunar month of 1682: Kuranosuke becomes wakashugata and plays at the Ichimuraza in the drama "Oguri Chûkô Guruma". 1684 (? ): Noda Kuranosuke takes the name of Noda Kuranojô. 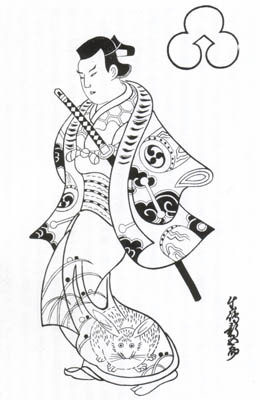 1693: Noda Kuranojô takes the name of Ikushima Shingorô. 6th lunar month of 1699: Shingorô plays at the Yamamuraza the role of Yamatonosuke in the drama "Isshin Onna Narukami". 1st lunar month of 1700: Shingorô plays at the Ichimuraza the role of Nagoya Sanzaburô in the drama "Keisei Hama no Masago". 11th lunar month of 1700: Shingorô goes to Kyôto and plays at Miyako Mandayû's theater, sharing the stage with the actor Kirinami Senju I. 3rd lunar month of 1702: Shingorô goes back to Edo and plays at the Yamamuraza the role of Yamada Saburô in the drama "Kôbai Sumidagawa". 11th lunar month of 1702: Shingorô plays at the Ichimuraza the role of Takiguchi in the drama "Yorimasa Hôraizan". 11th lunar month of 1704: Shingorô plays at the Yamamuraza the role of Yorimasa in the drama "Yorimasa Gozen Nô". 11th lunar month of 1706: premiere at the Yamamuraza of the drama "Taihei Shusse Kagekiyo", which is considered as an earlier version of the Kabuki Jûhachiban drama "Kagekiyo"; Shingorô plays the role of Chichibu no Shôji Shigetada [casting]. 3rd lunar month of 1707: Shingorô's rank in the Edo hyôbanki, tachiyaku section, is jô-jô-kichi (superior - superior - excellent). 11th lunar month of 1707: Shingorô plays at the Yamamuraza the role of Ariwara no Yukihira in the kaomise drama "Yukihira Obana Gitsune"; his stage partners in the roles of Murasame's lovers Murasame and her sister Matsukaze are Nakamura Gentarô and Tsutsui Kichijûrô. 1st lunar month of 1708: Shingorô plays at the Yamamuraza the role of Sasaki Moritsuna in the drama "Keisei Sasaki Mondô". 11th lunar month of 1708: Shingorô plays at the Yamamuraza the role of Yorimasa in the kaomise drama "Yorimasa Shiki Samba". 11th lunar month of 1711: Shingorô plays at the Yamamuraza the role of Chihara Sakon in the drama "Shida Konjiki no Uruko". 3rd lunar month of 1713: premiere at the Yamamuraza of the play "Hana Yakata Aigo Zakura", which is the first version of "Sukeroku"; Shingorô plays the role of the sake-seller [casting]. 2nd lunar month of 1714: the love affair, which involves Ejima, a court lady who serves the mother of the Shôgun, and Shingorô, is discovered in the backstage of the Yamamuraza. This incident, which breaks the boundaries between samurai and commoner, is a serious crime for the authorities, which decides to deal ruthlessly with the culprits: Ejima and Shingorô are exiled to different places, those in the Shôgun's household who are held responsible are executed, the Yamamuraza is definitively closed and its management is heavily fined [more details]. 13th day of the 2nd lunar month of 1742: Shingorô is back in Edo. 1743: Shingorô dies in his home in the district of Kozuna-chô.